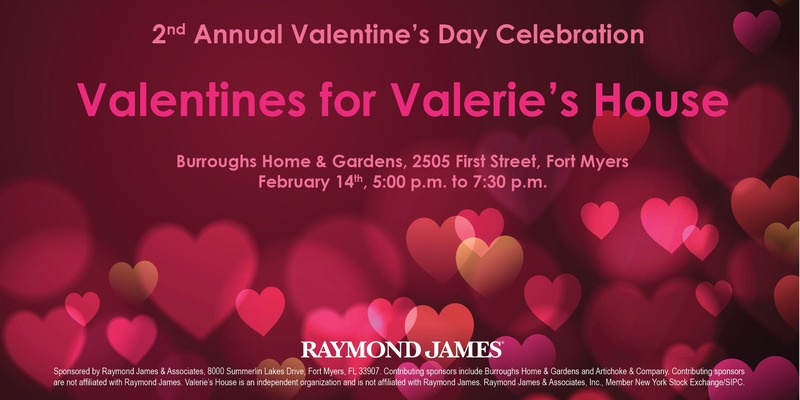 Join us for the second annual Valentines for Valerie's House at the Burroughs Home & Gardens—a downtown Fort Myers treasure. Valerie’s House is a local non-profit whose mission is to help children and families work through the loss of a loved one together and go on to live fulfilling lives. We are so honored to celebrate Valerie's House on Valentine's Day—a day of love for family, friends, and community. Enjoy a fun and relaxing evening with friends while supporting a worthwhile cause. This year's event features live classical guitar music from local musician Dave Byron, delicious hors d'oeuvres from Artichoke & Company, and an assortment of beverages, including beer and wine. In keeping with the spirit of Valentine's Day, we will have a beautiful candy table designed by The Perfect Table out of Cape Cod, Massachusetts. Bags will be available for you to fill and take home! Purchase your tickets here in advance. No tickets will be sold at the event. All proceeds from the ticket sales go directly to Valerie's House, Inc. No additional fundraising will occur at the event. Parking is available across the street from the Burroughs Home at the Langford-Kingston Home. Dress in festive, dressy, or casual attire. Please contact Carolie.Burroughs@RaymondJames.com with any questions.